The TLI iMicro WiFi Internet Microscope is one of our most veratile digital microscopes. It can connect to most devices and is ideal for schools implementing BYOD. 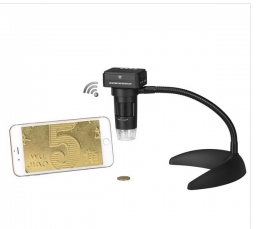 No need for an external home, school, or business WiFi, this WiFi microscope can be used anywhere. It can also be used remotely making it ideal for outreach programs and environmental education centres. Built-in 6 LED illumination with variable light intensity control. Uses Wi-Fi to connect to iPhone, iPad and Android devices. Connect to internet via router to view remotely. Saves images to micro SD card. Rechargeable lithium battery. DC 5V plugpack included. Solid stand with flexible arm to provide multiple positions.